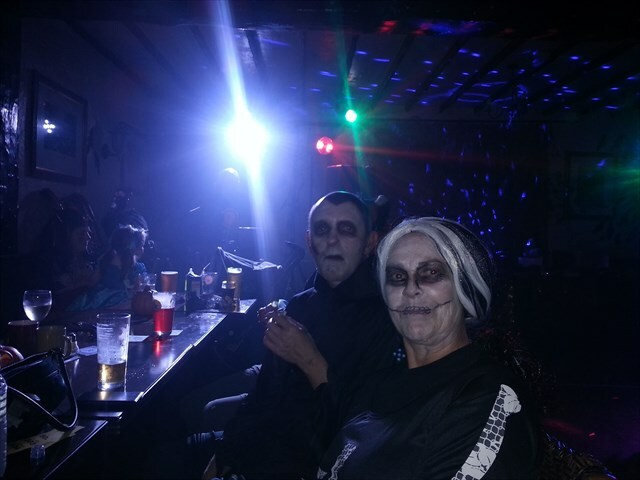 About this time of year we have previously travelled to England to the Halloween MEGA but this year that event is having a well earned year off so we looked around for something to take it’s place. There was lots of ‘chatter’ on various Facebook groups about an event in North Wales held by Martin&LindaBryn. We met Martin last year and again when he and his caching pal, Rob, when they visited the Isle of Man back in February. So we started planning a trip to Bala and got a room in the Bryntirion Inn for the weekend. Martin not only runs this pub with Linda but has placed some of the best geocaches we have ever seen in the area around the pub. 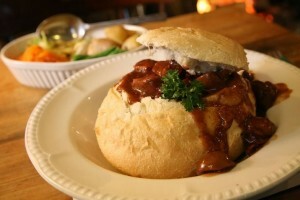 The Bryntirion Inn has to be highly recommended both for its real ales and its great food. The menu is just amazing and one of the specialities ‘The Bryn Bara’ comes with a challenge – if you can eat two of them you get them free! Talking about challenges, we came here for a Halloween event but we intended to do more than just attend an event and find tupperware in the woods! We are also here to see what challenges and interesting caches we can find. So before we got to the Bryntirion Inn we went in search of an old cache to fill in one of our Jasmer squares. For the Jasmer Challenge, you must find at least 1 cache in each month from May 2000 to the present date. 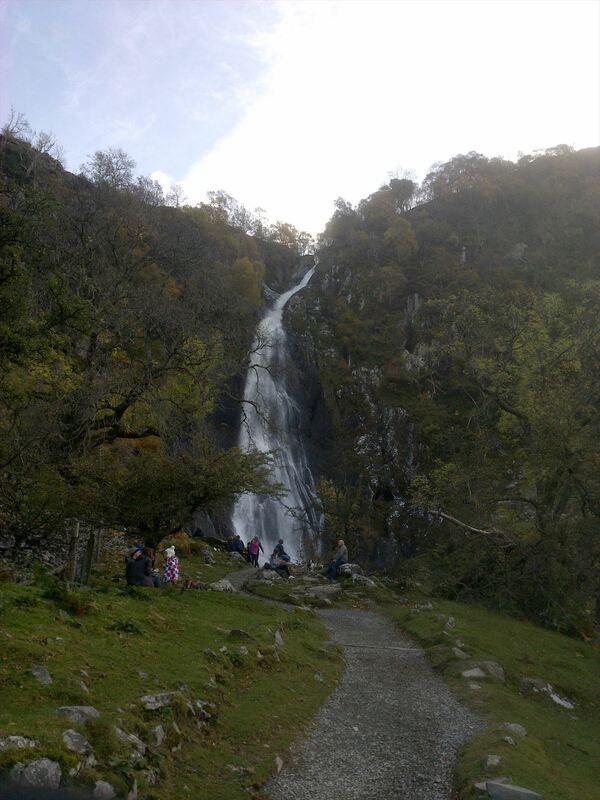 So we set off to Aber Falls and GC1873 Waterfalls Spectacular placed back in August 2001. The most popular of the falls at Aber. 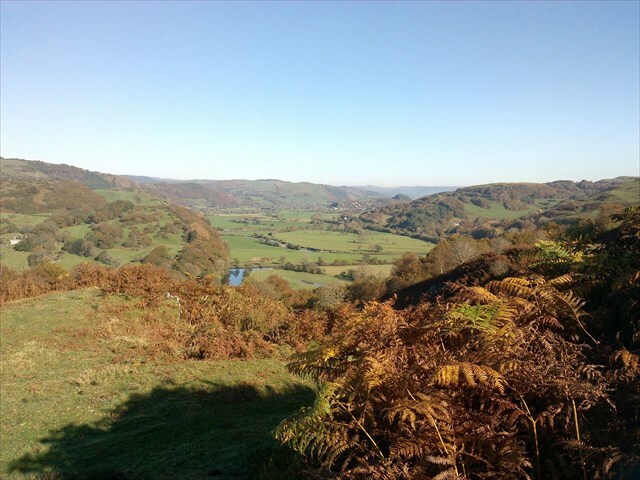 It was a lovely, if muggle infested, walk to the first falls and the climb to the cache is steep but not as challenging as some previous finders would suggest as it is not close to any cliff edges. There’s a string of caches on the way to the falls too, so they had to be found. 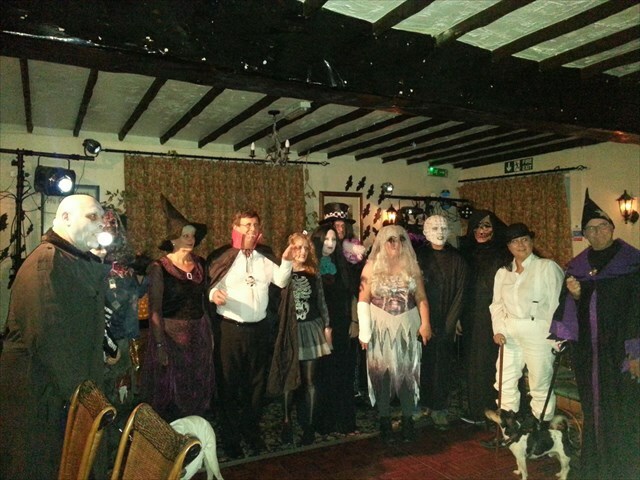 Then it was on to an evening event held by our old friend and ex-reviewer, Deceangi, in the village of Corwen then back to the Inn for a ‘Bara’, a pint and to meet with Sir & Lady Lannies. The next morning there was an air of excitement at breakfast as we all planned to attempt what, for us, was our first Reverse Cache. This is where we are given the locked and sealed cache box from the start and we have to follow instructions that it provides on an LCD display. When we arrive at the final co-ordinates the box should magically open (or not!). 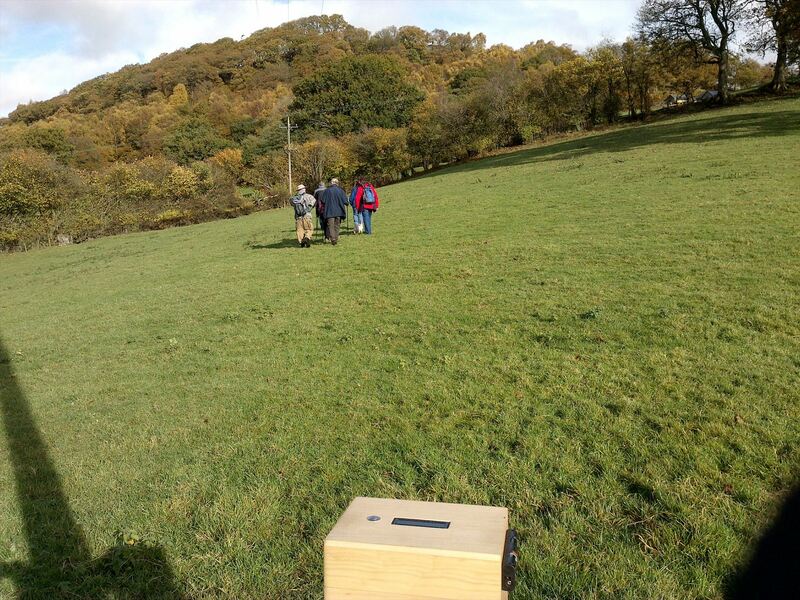 This proved to be an excellent walk and Phil from ‘The Lannies’ carried the box and read out the instructions for the first part of the route. Along with ‘cowriecreek’ and ‘Brenin Tegeingl’ we followed the route into some beautiful woodland. Into some beautiful woodland with the reverse cache box shown in the foreground. As we approached what we thought was almost the final waypoint the box decided to lose satellite reception and ceased to guide us. At the top of the hill was a monument and we sat resting for a moment placing the box on a stump. Lady Lannie nudged the box and it started working again telling us to retrace our steps! So it had to be done and soon the box revealed it’s contents and we all signed the log book. After that we left the ‘Lannies’ and ‘Brenin Tegeingl’ whilst they prepared for tonight’s event and we went with ‘cowriecreek’ to attempt the nearby ‘Clock’ series. 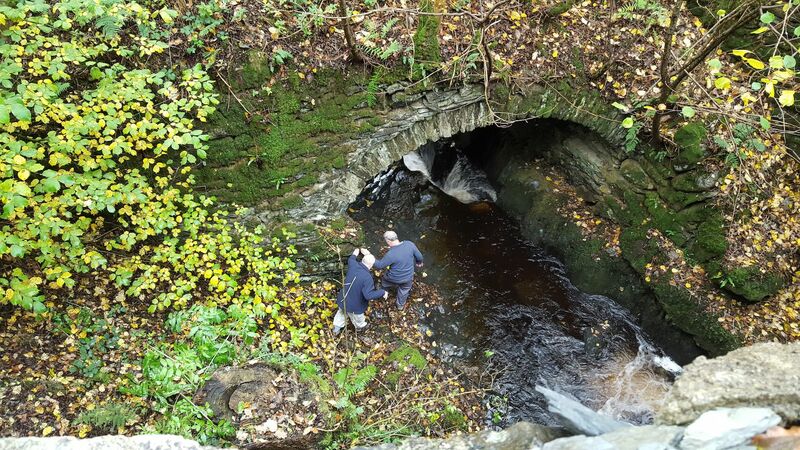 This series of 13 caches is set 1200ft above sea level, on a gentle walk around a near circular forest track with views along the Dee valley. After that was completed we swept up some more caches as we returned to the Inn for the first evening event. Phil (Sir Lannie) provided the entertainment with a disco but Martin announced a new night cache had been published so off we all went, into the night! Now Martin is known locally as ‘Dr. Evil’ and all his caches have a wicked twist. This one was no exception! Several false trails had been laid which foxed some of the leading group, leaving those at the rear to end up finding the container….but how to get at the log book? As there is a container like this on the Isle of Man we had the means to open it and be FTF to sign the log! Then it was back to the Bryntirion Inn for more geochat with our good friends Canalcruisers from South Wales. It was also good to meet up with many other geocaching friends – Team Airborn 12, SirPhilPamAndRob, linedancers, lemonydogs and many, many others. As someone said “If you only attend just one event in your life , it has to be one organised by Martin and Linda”. We spent the next day caching with Canalcruisers and cowriecreek and the target for today was a D4.5/T4 Challenge cache, GC4N4QK, Reviewer’s 25 Challenge – GOLD. But before we ventured out into tough territory we attempted some more of ‘Dr. Evil’s’ caches. The ‘Mechanical Eye-Pad 101’ and ‘Jailbird Field Puzzle 2’ were amongst the ones we laughed about afterwards! Then it was on to the serious business of the T4 cache. To qualify for this cache you must have found caches that have been published by 25 different reviewers, before you can log the find. As we have found caches published by 94 different reviewers we were well qualified but….we still had to sign the log! We had been warned that SirPPR had done this cache whilst dangling from a rope so we weren’t sure we could make it but Dr. Evil assured us that with a fair wind and less torrents of water in the river today we should be fine! At the location of the cache, the three musketeers, aka Mr. Twoofnine, Mr. Canalcruisers and Mr. Cowriescreek rose – sorry, descended – to the challenge. The other halves decided that someone had to stay on the bridge to take photos! It was very wet and slippery but the river was only moderately high so they managed to reach GZ and make the find. A slightly quicker ascent route was chosen and they all arrived back without too much drama. 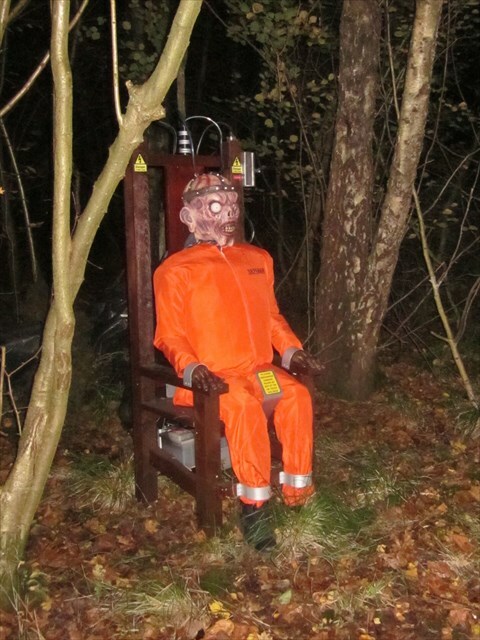 In the evening we were due to don our fancy dress at the ‘Haunted Hill‘ halloween event back at the pub but before that, we promised ourselves to find the much publicised ‘Mission Impossible‘ cache and the night caches placed by the same CO in a nearby forest south of Bala. 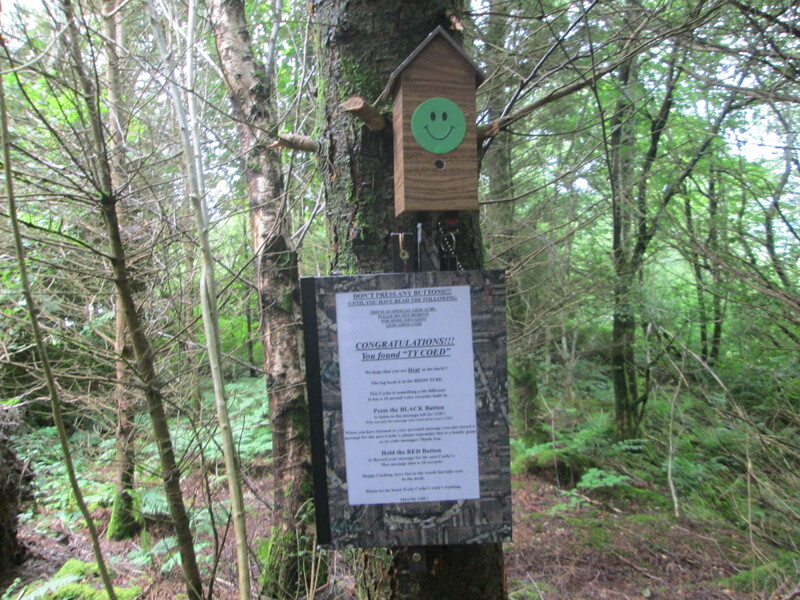 Mission Impossible can only be opened once you have found the 6 feeder caches along the Bala lakeside. After that it was a quick bite to eat then off to attempt the night caches, the first of which was a ‘Chatterbox‘, a talking cache. You sign the log and listen to the message left by the previous finders. Before moving on you can record a message for the next finders. 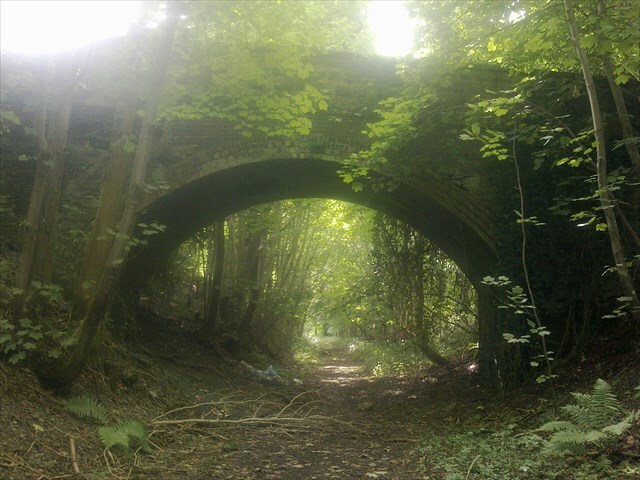 A great idea and a neat cache but it all went downhill from there……. We found the first couple of caches at dusk but as it became darker it was clear that there was no night trail or even any sort of marked trail! We just fought our way through the thickest of undergrowth and over barbed wire fences to avoid fallen trees. The terrain was horrific, fighting though fir trees, over and under fallen trees, through ditches, and we got absolutely filthy! We may laugh about this later, but at the time we were just glad to get out of spooky woods. We returned to the Bryntirion Inn and cleaned up. We made the effort and put on fancy dress and even did a bit of dancing to Phil’s great disco at the end of the evening. We won a couple of raffle prizes, including a rock cache which was not able to fly home with us, but it felt good to win! The raffle made a tidy sum of £196 towards the North Wales Maze and Mega next year. 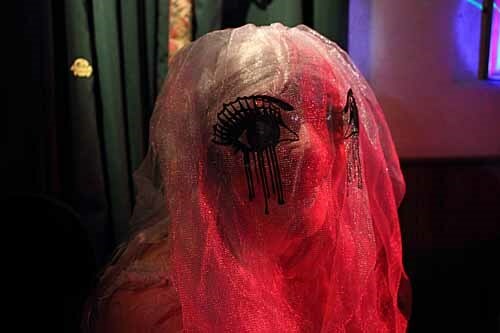 We didn’t win a prize for our fancy dress but the competition was extremely good. At midnight an exciting announcement was made. The venue for the 2018 UK Mega has been decided and it will take place in Yorkshire. Not too far to travel from the Isle of Man then! Thank goodness we only had to crawl upstairs to fall into bed. How many hours to the breakfast event?! 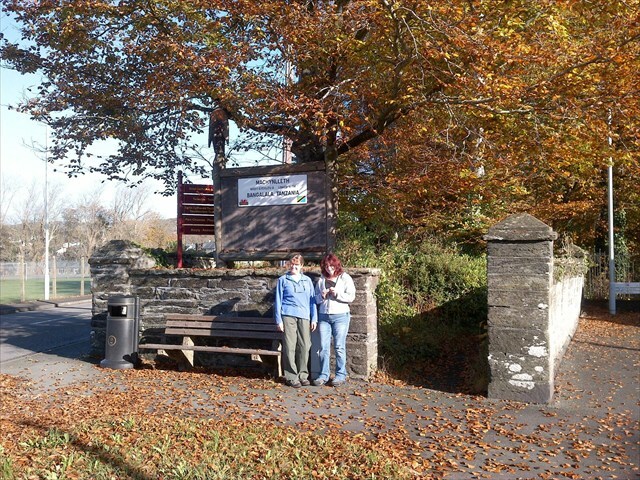 We then headed towards South Wales on a geocaching route planned for us by Canalcruisers. First we headed for two caches both with Manx connections. 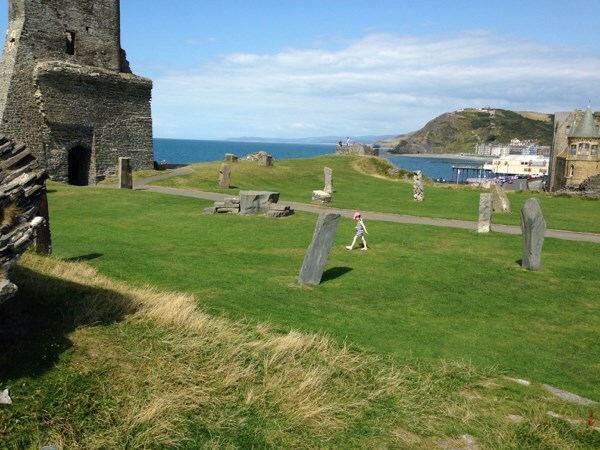 We then travelled via Aberystwyth and picked up a challenge cache and an earthcache both in Aberystwyth Castle. That was it for the weekend – quite a busy one! We had a lot of fun caching and attending events, meeting lots of old friends and new. We must say a special thank you to all the COs and our EOs Martin & Linda for putting on such great events and for maintaining all their evil caches. We now have the rest of the week to look forward to, caching on the Wirral, more Jasmer squares to fill and our first ever GIFF event.